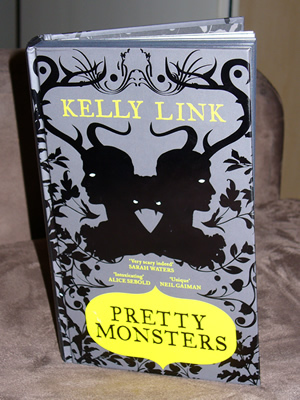 Pretty Monsters brings together 9 of Kelly Link's stories into a collection aimed at young adults. The stories are wryly funny, spine-chilling and occasionally outright frightening (if I'd read "Monster" at night I'm fairly certain I'd have had nightmares). Perhaps most importantly for such surreal stories, the characters are real, easy to relate to. They're all teenagers and you can feel their awkwardness, the strange way they look at the world, and their agonies as they begin to make their own way in the world. But this world, as the inside covers tells us, is filled with such things as: shapeshifters, aliens, pirates, a boy named Onion, a handbag with a village in it, and possibly carnivorous sofas. Of the 9 stories included in the collection only one - "Pretty Monsters" - is new, but they work together beautifully so reading the two I'd read before (Magic for Beginners and The Faery Handbag) felt new. I think my favourite was "Monster", but each and every one has something special about it. "The Specialist's Hat" is particularly impressive with its atmospheric creepiness and completely disturbing babysitter. The title story uses an innovative structure to tell a multi-layered (and beautifully dark) story about werewolves. "The Wrong Grave" ~ in which a young man digs up his dead girlfriend to retrieve his poems - and a surprise. Inspired by the story of Elizabeth Siddal's exhumation. "The Wizards of Perfil" ~ where a young girl is bought to be a slave for wizards and learns something new about herself. "Magic for Beginners" ~ Jeremy and his friends watch every episode ofThe Library. But is it just a fictional tv show? And why was he bequethed a phone booth in Las Vegas? "Monster" ~ campfire tales get even scarier when an unwanted guest shows up. "The Surfer" ~ Dorn's father kidnaps him and takes him to Costa Rica. But will the aliens return? "The Constable of Abal" ~ keeping ghosts on a string is a strange thing to do - especially when your mother has killed one of them. "Pretty Monsters" ~ will Cabell Meadows fall in love with Clementine Cleary? And why do Czigany and Parci have to be home by 5pm? The book itself is beautiful: when I opened the parcel I was delighted. It feels lovely to hold, is a startling black and bright yellow, and has soft touchy thingies on the cover. It definitely added to the experience of reading the stories and looks gorgeous on my bookshelf. I'm sorry it's taken me so long to get this review done (short as it is). I got sick, and then had real trouble doing the book justice. I don't think I have yet. So, to get a proper feeling for this marvellous collection, I suggest you read it yourself. Pretty Monsters was published in October 2008 in the USA and comes out in the UK on 15 October 2009.